These Formula 1 teams trust the analysis of their engines to components from Bilz: BMW, Mercedes, Ferrari, Toyota, Renault. When your objective is to achieve the highest possible performance as measured in thousandths of a second, you choose solutions from Bilz. 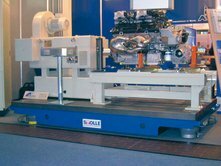 The fact that the automobile industry has increased its technical demands on testing and quality control systems during the past several years has led to correspondingly high demands being made on vibration isolation systems. Easy-to-use air spring insulating systems with level control which can be used for a wide range of applications have proven to be an ideal and advantageous solution. Mounting an API com engine test stand on Bilz Membrane Air Springs with mechanical level control.